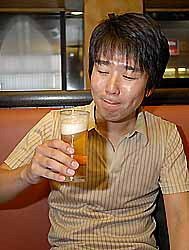 Ted Mahsun: Japanese Writer Drinks Beer After Winning Prize. A year after his wife won the Naoki Prize, writer Takami Ito wins the prestigious Akutagawa Prize. He celebrates by having a beer. Mmmm! Ito is married to Mitsuyo Kakuta, winner of the 2005 Naoki Prize. It is the first instance where a husband has won an Akutagawa Prize and a wife the Naoki Prize, though novelist couple Mariko Koike and Yoshinaga Fujita have both won the Naoki. "My mind went blank," Ito said. "I didn't know whether to say 'thank you' or ask if it was true (when informed about winning the prize)." Kakuta was delighted for her husband. "It's great," she said. "Congratulations." But what is the Akutagawa Prize? It is arguably Japan's most prestigious literary award. Established in 1935 by Kikuchi Kan, the editor of Bungei Shunjū magazine, in memory of novelist Akutagawa Ryunosuke, it is sponsored by the Association for the Promotion of Japanese Literature (Nihon Bungaku Shinkō Kai), and is awarded semiannually in January and July to the best story of a purely literary nature published in a newspaper or magazine by a new or rising author. The winner receives a pocket watch and a cash award of 1 million yen. Short stories and novellas win the prize more frequently than do full-length novels. Because of its prestige and the considerable attention the winner receives from the media, it is Japan’s most sought after literary prize.